5. Safer Solvents and Auxiliaries: The use of auxiliary substances (e.g. solvents, separation agents, etc.) should be made unnecessary wherever possible and innocuous when used. The 5th principle of green chemistry promotes the use of Safer Solvents and Auxiliaries. This includes any substances that do not directly contribute to the structure of the reaction product but are still necessary for the chemical reaction or process to occur. In the video for Principle #5, we talk about the impact of solvent waste and illustrate it by substituting dichloromethane, a commonly-used solvent, with a safer alternative. Solvents are the most common example of auxiliary substances. Usually, solvents themselves do not react with the reagents but are still necessary in reactions in order to dissolve reagents, mix all reaction components, and control the temperature of the reaction. After the reaction, more solvents are then often used to separate and purify the product from other reaction components and any side-products. This reliance on solvents means that a massive amount of solvent waste is generated during a typical chemical reaction. Reducing solvent use is therefore usually a high priority for chemists working on making their reactions greener, especially when working on an industrial scale. For example, Pfizer was able to reduce the amount of solvent waste generated in its synthesis of Viagra from 1300 kilograms to just 22 kilograms for every kilogram of Viagra made. This huge reduction, and others like it throughout the chemical industry, ends up making a big difference in the resulting environmental impact and demand on resources. Although reducing solvent amounts altogether is certainly important, it’s also good to remember that every solvent has its own properties. A toxic and environmentally persistent solvent like dichloromethane should be avoided whenever possible. Many guides have been created to help chemists replace solvents of concern, such as these guides by Pfizer, GlaxoSmithKline, and Sanofi. A recent paper also compiled these guides into a more comprehensive overview. In our video, we used column chromatography to show an example of solvent substitution in action. Column chromatography is a separation method commonly used by chemists. It works very well for separations but, like many other solvent-based separation methods, the downside is that a large amount of solvent is required. We separated compounds found in spinach extract using column chromatography, to show how solvents can be substituted for safer choices. We used a convenient guide for substituting dichloromethane in our column chromatography demo. Using this guide, we replaced the dichloromethane/ethyl acetate (95:5) mixture in Column 1 with its alternative of heptane/isopropanol (85:15) mixture in Column 2. 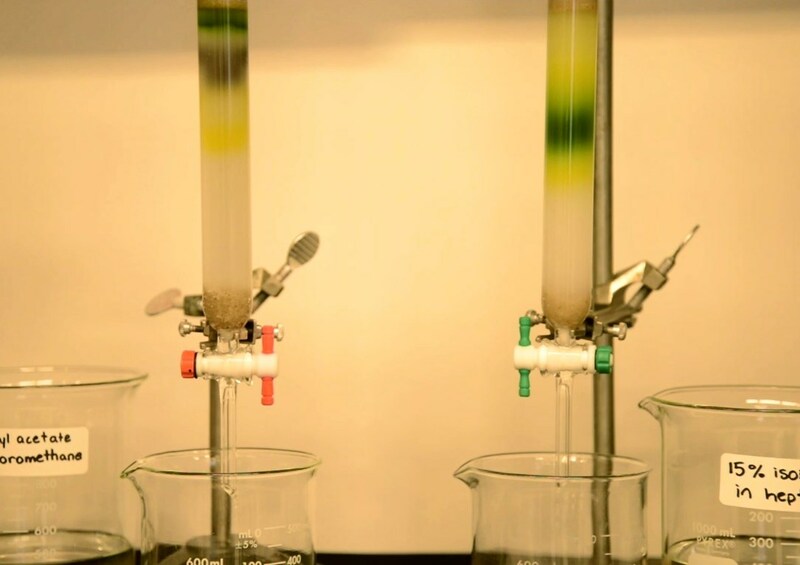 We then compared the separation of compounds in spinach extract between the two columns. Column chromatography is a complicated process with a lot of factors to consider, so we had to simplify it for the purpose of the video. This YouTube video explains the basics very well for those who want to learn more. Essentially, the compounds that flow through the column are passed between the solid phase (the silica gel in the column) and the liquid phase (the solvent) at different rates, which causes them to separate as they travel downwards. The solvent choice greatly influences how well compounds separate. Although no two solvents work exactly the same way, substitution guides like the one we used in our video have already done the tedious work to help chemists choose the greenest option that will work for their reactions. Considering the integral use of solvents throughout chemistry, the implementation of Principle #5 in even seemingly small ways can end up drastically reducing the amount of solvents used altogether and move towards safer options whenever solvents are required. Pfizer’s reduction of waste in Viagra production: P. J. Dunn, et al., Green Chem. 2004, 6, 43-48. Dichloromethane use, concerns, and substitution in column chromatography: J. P. Taygerly, et al., Green Chem. 2012, 14, 3020-3025. Pfizer: K. Alfonsi, et al., Green Chem. 2008, 10, 31-36. GlaxoSmithKline: R. K. Henderson, et al., Green Chem. 2011, 13, 854-862. Sanofi: D. Prat, et al., Org. Process Res. Dev. 2013, 17 (12), 1517-1525. Compilation of guides: D. Prat, et al., Green Chem. 2014, 16, 4546-4551. This entry was posted in 12 Principles Videos, GCI Initiatives, Green Chemistry Education, Laura Reyes and tagged chemistry, column chromatography, green chemistry, solvents. Bookmark the permalink. Well Thanks for an informative video! Safer solvent is really very important concepts for experimental use.